TORONTO (Apr. 4) – For the second time in less than 11 months, Patrice Bergeron has likely hammered a final nail in the Toronto Maple Leafs coffin. Having scored the overtime winning goal at TD Garden last May 13 to cap a remarkable comeback by the Boston Bruins, Bergeron may have again snuffed out Toronto’s last playoff hope when he tumbled backward onto Maple Leafs goalie Jonathan Bernier Thursday night at Air Canada Centre. Bergeron received more than a little help on the play (which occurred at 8:22 of the third period), as Leafs defenseman Paul Ranger shoved him directly onto Bernier and was assessed a minor penalty for interference. Though Randy Carlyle called it a “lower-body” injury (duh!) 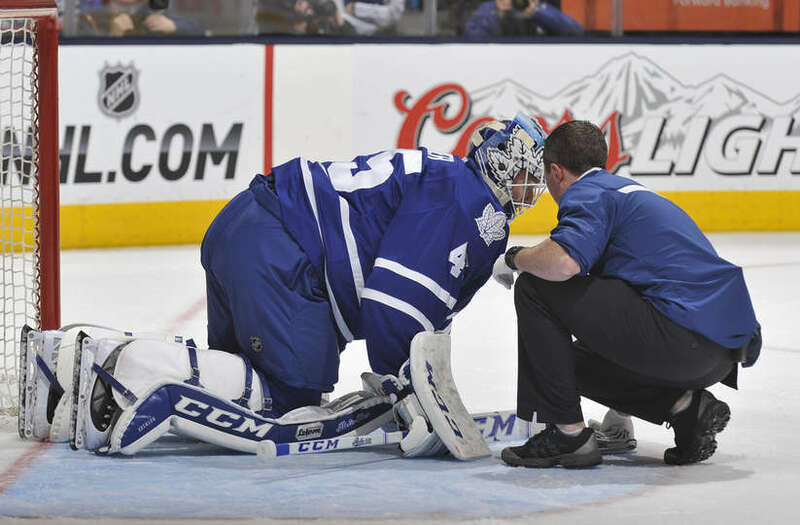 after the game, Leafs announced today Bernier has a a strained Medial Collateral Ligament (MCL) in his left knee and will be sidelined “for three weeks.” Bernier missed five consecutive games (all Leaf losses) from Mar. 16-23 with a groin injury worsened in an ill-fated start at Los Angeles. So, the Leafs. No. 1 goalie is done for the season and would not start the playoffs were the club to somehow qualify. Of course, if Leafs do grab the second wild card, it would be as a result of James Reimer winning four consecutive games: Winnipeg in the home finale tomorrow night; then on the road in Tampa, Sunrise FLA and Ottawa. Given the opposition (Lightning excluded), this is not an impossible task for the streaky Blue and White, and Reimer has won a number of big matches, including three against Boston in the playoffs last May. Not an easy schedule, by any means. But, Columbus likely requires three wins at most to fend off the Maple Leafs. Along with the Blue Jackets and Blackhawks, Leaf eyes will be on two other games tonight: Buffalo at Detroit and Washington at New Jersey. Tomorrow night, it’s Winnipeg at Toronto, Washington at New York Islanders, Detroit at Montreal and New Jersey at Carolina. Undeniably, desperate – perhaps futile – scoreboard watching for fans of the Blue and White. And, Patrice Bergeron is largely to blame… again. BERNIER IS NEARLY PRONE ON THE ICE – RESTING ON HIS KNEES AND ARMS – AND IS THEN ASSISTED TO DRESSING ROOM WHILE KEEPING LEFT LEG OFF THE ICE. EARLY-SEASON GAME vs. BOSTON IN 1968-69.